Pearls range from tiny 1mm seed pearls to 20mm South Sea giants (mortgage your house if you want a strand of those). 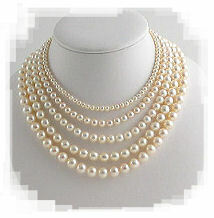 For round pearls, the most common size is 7-7.5mm. Pearl prices rise sharply after 7mm to 8mm, reflecting the dificulty of culturing large, good-quality pearls. The longer the mollusc remains in the water, the more chance of it dying of disease or some other cause, or of the pearl inside losing it's shape or developing unsightly blemishes. Pearls are measured in millimetres through their round diameter - perpendicular to the axis of the drill hole. 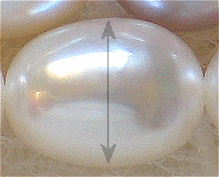 For example, this 9mm oval pearl is measured along the line of the arrow. The Pearl of Allah, is the largest known pearl measuring 9.45 inches in diameter and weighing 6.4 kilograms (14.1 lb). In 2006 the appraisal value was US$61,850,000. 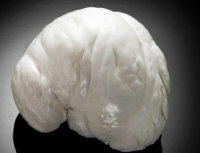 The pearl was taken from a giant clam off the coast of Palawan in May 1934 by a Filipino diver. Here's an interesting account of it's history. Probably the most famous pearl is the 'Hope Pearl' named after it's owner Henry Hope and displayed in the Natural History Museum in London. 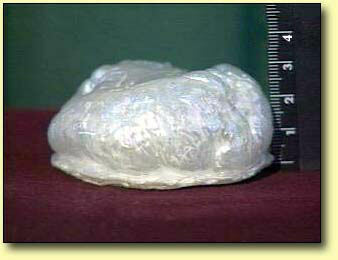 The pearl was found early in the 19th Century and weighs about 90 grams. More recently, the silver coloured pearl shown above weighing 170 grams was found on the seabed off an island of Myanmar (Burma). It's understood that the fisherman who found the pearl donated it to the then military government, thus avoiding the unpleasantness associated with an involuntary donation. 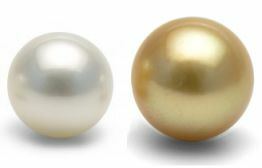 The world's largest, most expensive, and most desirable white and golden South Sea pearls come from the waters of Australia, Indonesia and the Phillipines. 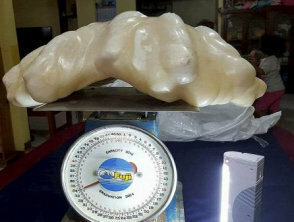 A gentleman from the Phillipines invites The Pearl Market to buy his prized 'pearl' weighing 5.25kg. If anyone's interested we still have his telephone number. In September 2016 this monster was reported to have been discovered in the Phillipines. Not realising it's value, a fisherman claimed to have been keeping it under his bed as a good luck charm until his shack burned down. 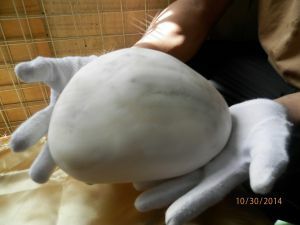 Extracted from a giant clam and weighing in at a massive 34kg with an estimated market value of US$100 million, it remains to be seen whether the pearl is verified as genuine.